Various surgical procedures have been described for the treatment of flatfeet. These surgical procedures may include osteotomy, arthroereisis, arthrodesis, and/or soft tissue procedures. Procedure selection should be based on clinical and radiographic findings, degree of arthritis, patient age, and activity level. Surgery is often performed to give the patient a more functional and stable foot. Several procedures may be required to correct a flatfoot deformity, depending on the severity of the problem. *Tenosynovectomy—a procedure to clean away (debridement) and remove any of the inflamed tissue around the tendon. **Tendon Transfer—in which repositioning of a tendon, or part of a tendon, are used to help repair damage and improve joint function. *Osteotomy—a cut made into a bone to move the foot structure back into alignment. An arthroeresis implant is inserted into the subtalar joint, (the joint just below the ankle), to limit overpronation. Arthroeresis implants aren’t typically tolerated in adults due to long-term adaptive changes that occur. 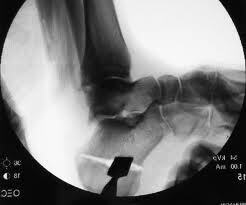 *Arthrodesis—Fusing of one or more bones together to eliminate any joint movement, which stabilizes the foot and prevents any further deterioration or damage. Combinations of the above procedures may be used to correct the Adult or Pediatric Flatfoot. Your Foot and Ankle Surgeon with determine the cause of the Flatfoot and design a surgical plan using the above procedures, if surgical correction is warranted.